Precious finds from the beach….I think I could walk until dark, just looking for shells, stones, broken pieces of anything returned by the salty water. I think my earliest search began when I was a 16-year-old, enjoying the beach for the first time. Did I mention this was over a ten-hour drive for us? Most people’s first reaction is disbelief that I was that old before seeing the ocean. I have many family members that have still never experienced its awesomeness. For an entire week, I scoured every shell that could be found. I was fascinated by the ability to find a whole shell, as well as scooping up shards of worn stones that once resembled a seashell. That summer, I toted a mega load back to West Virginia. I currently live within a two-hour drive to the sandy strands of Carolina Beaches. Some days, I can almost smell the salt air, and feel the continual winds that blow on the East coast. Is that possible? probably not, but in my mind I am close enough to feel it. Every year my goal is to spend more time there than the year before. This year, the goal will remain the same. Searching for shells is just something I love to do. They are not hard to find unless you are on one of the beaches that are cleaned every day (I hate that!!!) shhhh.. to all the Myrtle Beach diehard fans. 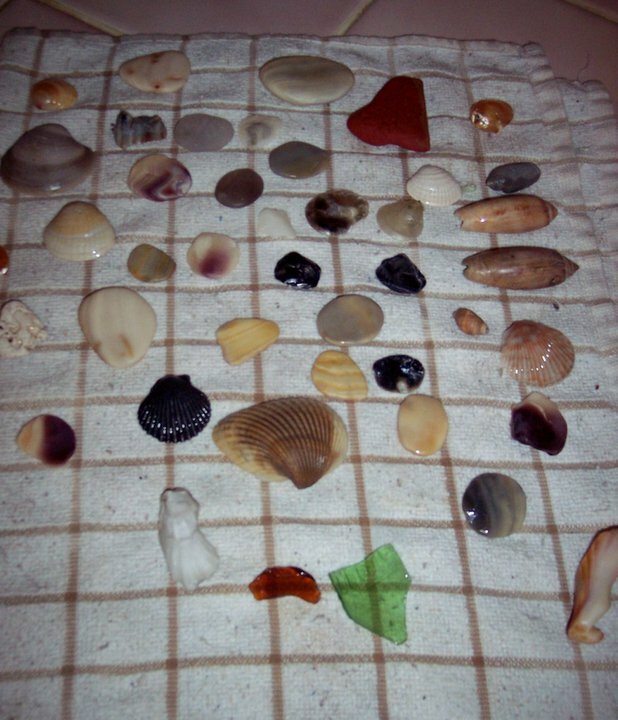 It has only been within the last few years that I discovered an additional pleasure to shells….SeaGlass. So many different types, colors, shapes and sizes – Each one different and unique. Where did it come from? I was determined to find out its story. I knew that I had to own at least one piece and focus later on finding my very own. My first stop was Ebay – they have everything right? It didn’t really matter to me where it came from, but I knew it was something I had to have. I knew that ultimately, it came from something I love, the sea. 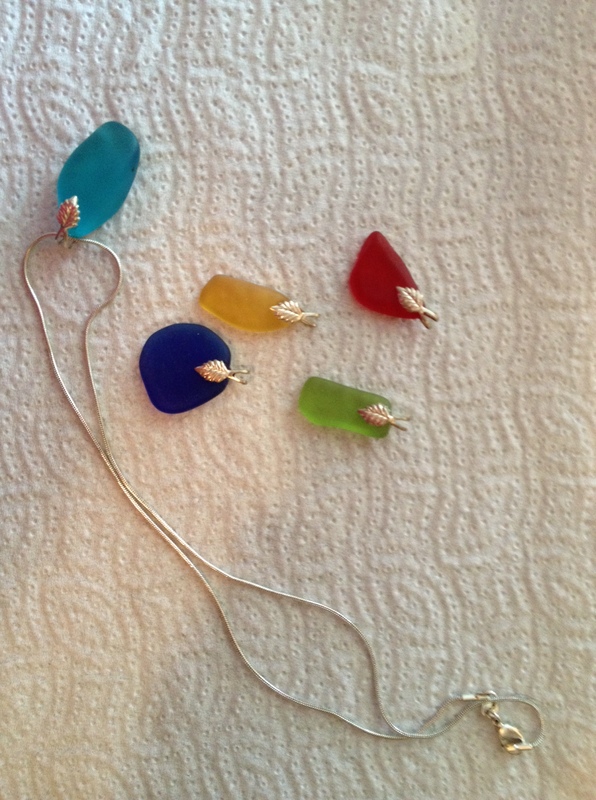 So here it is.. my first “set” of seaglass jewelry. Inexpensive and easy to purchase, I wear it often. It doesn’t matter if these are manmade, it represents something that I love. I did search to find out how it came to be. There were the logical explanations of glass items that were once dumped into the oceans either on purpose or accidental – medicine bottles, soda bottles, even red pieces of glass tailights torn from cars that were lost off of barges in vast open waters. That’s interesting but not quite as intriguing found in the myth of the tumbled pieces of glass. It was said to be “Mermaid Tears”. It was said that every time a sailor drowned at sea, the Mermaids would cry and the sea glass was their tears washing up on the shore. Okay so maybe I don’t believe so much in the whole Mermaid story, but here are a few things that I do love about Seaglass…. 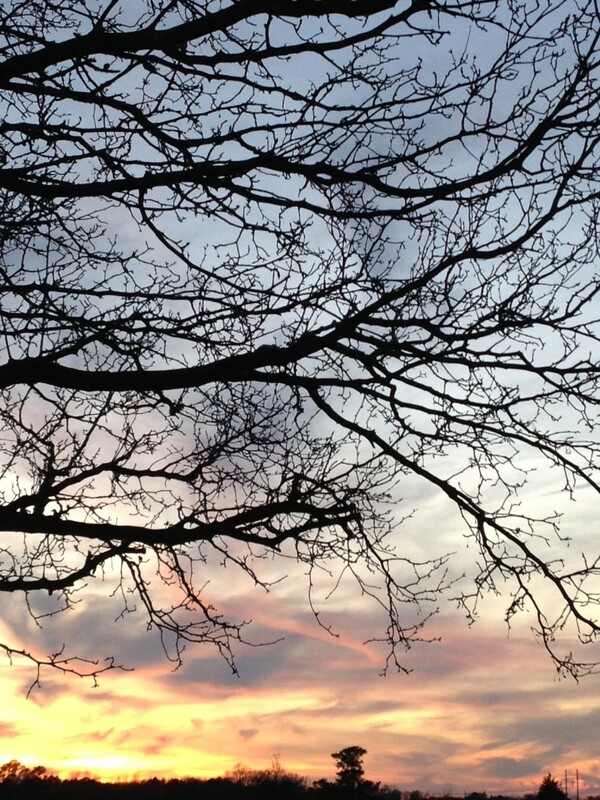 The way nature takes something mundane… and turns it into something beautiful. The immediate association with the salty smell of brine, the waves of the ocean and unstoppable time. It has a distinct connection to the past that is as unique as a single fingerprint. Time has to be used as a tool to smooth the sharp edges…making it delicate but strong. SeaGlass is much like art. It is appreciated more inwardly by the person beholding it. I would love to tell you that “I” found these three pieces in my photo? I haven’t found one on my own yet… yet. As a matter of fact my eyesight is not what it used to be…the special part about these three pieces? My daughter spotted them… but we searched for them together. We have them in a special container, referred to as “our” seaglass. She’s just like that and I love her for it! 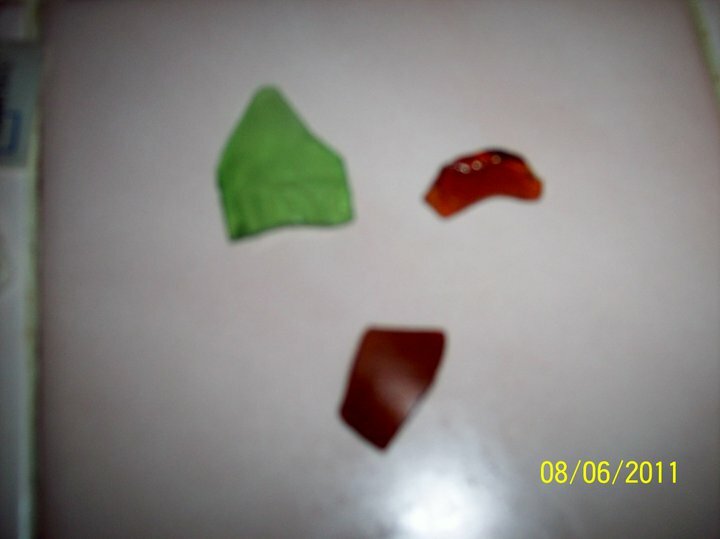 This season of summer I will continue my search for the glass from the sea…..anticipating the memories that will attach themselves to it… timeless and each one cherished….just like each piece of awesome seaglass. Rain. I don’t have to remind anyone that I do not like it. Today, the world is almost silent except for the sound of the raindrops hitting the window pane. Yesterday my thoughts were overcrowded and noisy, bombarding me with things beyond my control. Places I would rather forget and places I’d rather be. I’m still waiting on the invention of time travel. Oh, the places I would go, if only for a few hours. For now, I listen to the rain. 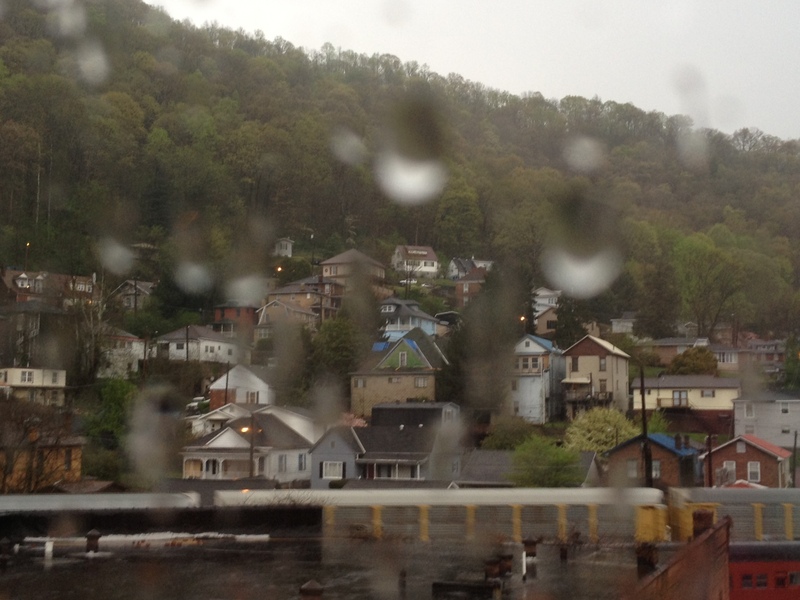 It is only overpowered by the sounds of the mighty N&S trains hustling through this mountain town. It is quiet in the place that matters most – my soul – it seems to have an inner hush this morning. Although I am fully aware of my surroundings, the very reason for this particular visit…. I am thankful, just for this moment of peace. I will hold onto it for as long as I can. I refer often to the “peace that passes all understanding” from Phil. 4:7…and it is just that. I don’t understand it, but I embrace it. I have learned to let it wash over me like rain in a barren place. It is a very different kind of rain, one that I thirst for when my soul feels like dust. 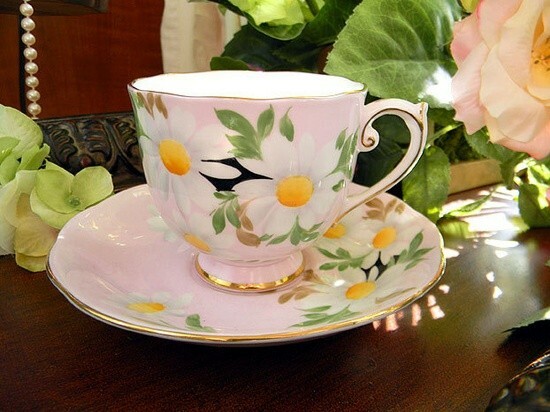 The rain is not forceful here this morning, it is gentle and soothing. This rain I love, only because I know that today there is more to the rain than just water. A fresh rain that is indescribable in my hometown today… It is a gift for this day. God has a way of washing away the dusty places with His rain, His Spirit….comfort that only comes from the master rainmaker. Saturate our souls today, Lord. Our needs are great. Hide and Seek was often a favorite game of mine during childhood. We had an entire alley to roam at night, never fearing anyone kidnapping us. The only sound we perked our ears for, was the sound of our parents calling us when it was time to come home. Hiding was fun, not being found was a great accomplishment. When you were “it”- it was sometimes exhausting trying to find someone in such a broad area. I was much better at hiding. Apparently, I am still quite good at hiding as an adult. Jokingly, a friend and I once referred to it as “Operation Ostrich” ~ when things were a little more than we could endure? In the mental sand pit our heads would go. It worked, if only temporary. I am still trying to keep my head out of the sand. To be honest? I like it there. I see nothing, I feel nothing, and I say nothing. Like the Ostrich, I think I am invisible. No matter what danger or turmoil surrounds me, I attempt to be oblivious. A temporary fix, until I am able to breathe again. Researching the Ostrich, I find that sticking his head in the sand is actually a myth. When he is threatened, he runs with all of his might – climbing to speeds up to 70 mph. I am not a runner physically, but mentally I can make long strides seem effortless. It’s like running in your dreams, and then you realize that no matter how fast your legs are moving, you can’t seem to gain any distance. I’ve looked for a place to hide all week, too many tragedies in the lives of the people who are part of my corner of the world. I feel the guilt for wanting to displace myself from the place they are-knowing their hurts. They don’t have the choice to remove themselves from their circumstances, having no place to hide. I am a coward. I say this because I don’t want to be here. I don’t want to revisit the place I strive everyday to leave, knowing that no matter what I say to encourage? it is still a place that no one wants to be. I don’t want my friends to be here. I don’t want my immediate family to be here. It is a desolate place that brings sadness, frustration, and the overwhelming need to find a place to hide. Learning more about the characteristics of the Ostrich, I find that he doesn’t hide forever. He faces the enemy at times head on. It is during this time that he uses every resource available to him. His legs are powerful, and strangely enough they can only kick “forward” So that’s what we do, we kick forward when we can no longer hide. Sometimes we can’t even feel our legs kicking or running, we just know they are from the evidence that another day has passed. My prayer is that you find rest in your hiding place, strength to continue to kick forward. I pray that you find the peace that passes all understanding (Philippians 4:7)…especially when nothing makes sense. I often saturate myself with one of my favorite songs…I hope you find the words as a beacon of light, shining through your darkest hours, abiding quietly and safely in your very own hiding place…Under His Wings. He shined his light…and called me to His side. is that I’m under my Lord’s wings. 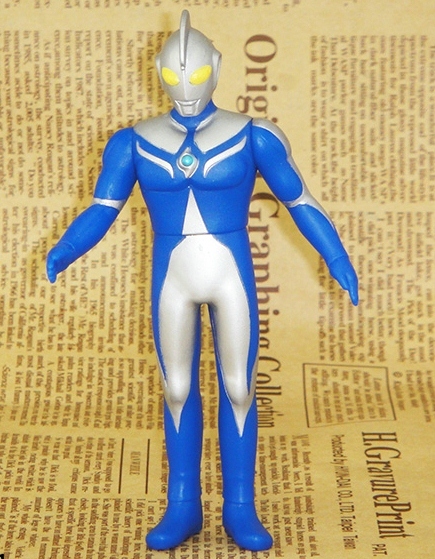 What a strange-looking creature he was… Ultraman. Honestly, I don’t remember him looking so strange. I do, however, remember calling for him quite often. As much as I can gather, Ultraman was a chinese based cartoon. He was the infamous hero of a village of children in China. Plagued by godzilla-type villains, the children could always call on their hero, and voila! Down would come Ultraman, battling the monsters to become the hero once again. My Momma would tell the story that when I was in dire straights with her, I would yell as loud as I could for “Ultraman”. I don’t have to tell you that he never came, but it didn’t stop me from believing that he would. The fact is, everyone needs a hero…someone to believe in. For my brother, it was probably more along the lines of The Lone Ranger, the ultimate superhero for little boys. He was pretty fond of the Comic Super Heroes also aka -Superman, Batman, etc. I also had an imaginary friend. Most of our family related it to me being an only child for the four years before my brother was born, but the friend caused my Momma to get a lot of looks and advice from those around her. Apparently, the imaginary one was a good friend, because I had him/her for quite some time. As I recall, my Daddy sat on him/her and I remember letting him know that he had “killed” my friend. RIP Imaginary friend.. making room for the baby brother I suppose. A hero and their identity changes throughout our lives. Most often they are replaced with that of real people. Each one as important as the one before, serving a purpose for that chapter in our lives. My Stepdad and my mother of course, filled those shoes for many years, after they were gone, the role shifted many times to my brother who stayed by my side throughout my Momma’s illness, then to my husband who held me through every step of her funeral. Many times my close friends have been my hero, unaware of the strength I gained through their kindness. Often times, my daughter fills those shoes, being the constant reminder of my purpose here. Everyone needs a hero. I also believe it is just as important to be one to someone when given the chance. Never miss the opportunity to be something good for someone when they are incapable of doing it themselves, be their song, when they have forgotten the words. I sometimes find myself wanting to call for Ultraman again…such a crazy thought, it’s the idea of a hero, someone to rescue me…protect me…make me feel worth the risk, or sometimes just to make the monsters go away. It is then that I remind myself that they are here, disguised as regular people, with invisible capes and superpowers to be used when I need them the most.